Prime Minister Narendra Modi on Saturday rebutted Congress criticism of the improvement in India's ease of doing business ranking saying those who worked with World Bank are now raising doubts over its ranking. At an 'Ease of Doing Business' event in New Delhi, he hard sold India as an investment destination saying ranking will improve further when the impact of the goods and services tax and all reforms are accounted for. "If reforms like Insolvency and Bankruptcy Code and commercial courts would have taken place during their times, the rating would have improved earlier," he said without naming anyone. Stating that the 'ease of doing business' ranking by World Bank was started in 2004, he asked which party was in power for the following 10 years. "I am a prime minister who hasn't even seen the World Bank building whereas those running World Bank used to be in this position," he said in oblique reference to his predecessor Manmohan Singh. He said an array of reforms during the last three years has led to India's ease of doing business ranking jumping 42 places to 100th in the world. Modi said the ease of doing business ranking improved because the government initiated reforms to end difficulties in the lives of people. These included simplification of tax filing, PF registration and withdrawal, quicker registration for new companies, simpler judiciary process for commercial dispute, easier construction permits and getting power connection. He said he has 'one life, one mission' of bringing change to India and its 1.25 billion people. The ranking for 2017 takes into account reforms initiated only till May 2016 and does not reflect the impact of the GST, which was implemented from July 1. The GST, he said, is the biggest tax reform and will have in 'moving towards a modern tax regime, which is transparent, stable and predictable' that facilitates business. Also, many other reforms that have already happened, but need gestation and stabilisation time, for them to be taken into account by the World Bank, he said, adding once all these combined are taken into account India will 'occupy a place of pride in the World Bank report next year and thereafter'. 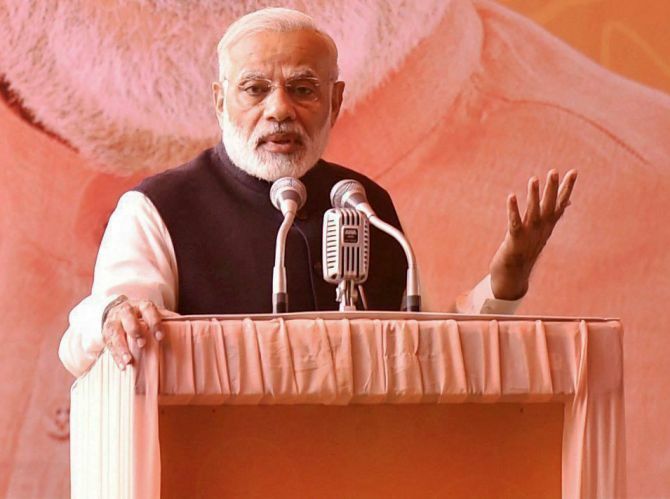 The prime minister said reforms undertaken by his government are far more extensive and went on to list out abolition of more than 1,200 archaic laws that complicated governance. "India has reached a position from where, now it is easier to improve further. Our efforts have gathered momentum. In management terms, we have achieved critical mass for a swift takeoff," he said. The prime minister said his government's moto is 'reform, perform and transform'. The agenda for boosting growth and employment, required many structural changes, many tough decisions and many new regulations as also changing the mind-set of the bureaucracy were required. "Over the last three years, the Union government has done a lot on these fronts. We have resolved a number of regulatory and policy issues facing businesses and companies," he said. Listing out initiatives of his government, he said manufacturing and infrastructure sectors are being given a big push, bold foreign direct investment reforms have taken place in 21 sectors and significant reforms have taken place in defence, railways, construction, insurance, pension, civil aviation and pharmaceuticals sector. "We are now among the most open economies for FDI," he said. Over the last three years, business regulations were systemically and critically evaluated to understand the pain points, he said. "With this objective, an extensive exercise was undertaken to redesign laws and re-engineer government processes to make business environment simpler and more conducive." An attempt has been made to align the Indian regulatory environment to international best practices, he said. He said India jumping by 42 positions in three years -- 30 position in last one year alone, to be ranked as 100th easiest place in the world to do business is a well deserved celebration. "Over the last three years, I have been constantly telling the domestic and foreign investor community that we in India are making sincere efforts to improve 'ease of doing business'. And Friends! India has Walked the Talk. The World Bank has recognised the 'stupendous work' done by his government in improving ease of doing business," he said, adding, "India has been identified as one of the top reformers." The improvement in ranking is indicator of good governance, measure of the quality of public policies and a benchmark of transparency of processes. "And, ultimately, it reflects the way people live, work and transact in a society." "I must make a special mention of the fact that while Ease of Doing Business is important for all businesses, it is critical for small businesses including small manufacturers. "This sector provides the bulk of employment in the country and to make them more competitive, we have to reduce the cost of doing business. The work on Ease of Doing Business must address the issues of these small businesses and manufacturers," he added.